My goal in this blog post is to give you some tips on how to get this task completed with the least amount of time and money invested as possible! The reason this is step one is because of the long wait times. It can take weeks or longer to get your first appointment where you will submit paperwork to see if you are eligible to take the test for a Japanese license. For me this meant going to the biggest city in the prefecture… which is 2 hours away from me, Gifu City. This was required to take the written test in English, and I figured probably they had experience dealing with foreigners. If you are not fluent in Japanese, have someone who is (preferably native) make the appointment call for you. It is a good idea to have someone fluent with you during each visit to the DMV ( 運転免許センター). They will likely give you a long list of information which you will need to bring to make sure you qualify. While you are waiting for your appointment you should be gathering you information and making copies of everything. Some of the things you will need. Let me say before anything else – if you have ANY evidence of your past driving history or record in the US – Save It! Look for that old drivers license if it’s still in a drawer somewhere. Japan wants to see evidence of your driving history from the date your license was initially issued. I’m talking high-school, 16 year old drivers license issue date (or as much as humanly possible). Additionally you must prove, without question that you lived in the US for at least 3 months (hopefully longer) with your current license before coming to Japan. Why? It is actually to prevent Japanese citizens from going abroad and simply getting an International Drivers Permit and using it in Japan. Is it better in Japan or the US? Check out this blog post. I’ve been driving for 25 years – but the California DMV only keeps records for 10 yrs. SO let’s start there. For my California driving history I had to immediately request form INF1125 by mail, and mailed to my mothers house (legal residence in the US). If you have it sent to an alternate address make sure you still use your own name. The printed report that they provide actually does list all the years of your driving history. There is also an unofficial online version you can request from the DMV website for $2. Whether or not they will accept the online printout is questionable. If you have no other option, i’d suggest printing out the receipt as well. Your paperwork will be gathered and taken away to some mystery location where it will be reviewed in a matter of hours. You can wait there… or in my case, I left – but stayed in the area – expecting their call. Once you’ve received their call, after reviewing the paperwork… surprise! Now someone will ask you various questions about your driving history and paperwork, basically to verify. I call it the interview because they asked me many questions that i failed to understand the significance. After a number of questions, I began to suspect that they really wanted to both verify my history – AND feel me out. How well do I speak Japanese? How careful of a driver am I? I don’t want to call it a personality test, but I think my point is clear. Show what you know, and display an attitude that you are taking this all very seriously. If accepted you will receive some literature and be able to schedule your test at a point in the near future. Most likely 1-3 weeks depending on the time of year. On the day of the test, you will once again need to bring EVERYTHING in regards to paperwork. If not-accepted it’s likely because you are missing something required. Take advantage of your time being in the area with the next step. You’llprobably receive a pamphlet with basic driving rules, which I didn’t find very useful. And a rough outline of what the practical test will look like. Helpful! This is a sample course only. I’m sure it changes often. You’re lucky in this regard. Japanese drivers must take a 100 question test while you get to take a relatively simple and obvious 10 question written test, and you can miss up to 3 questions and still pass. So my opinion is yes, of course, know all your Japanese road signs and basic rules of the road and required distances (signaling, following, etc). But your struggle will not be with the written test. Assuming you pass you’ll be given the practical driving test the same day. If you fail, you will need to reschedule at the time of next availability. 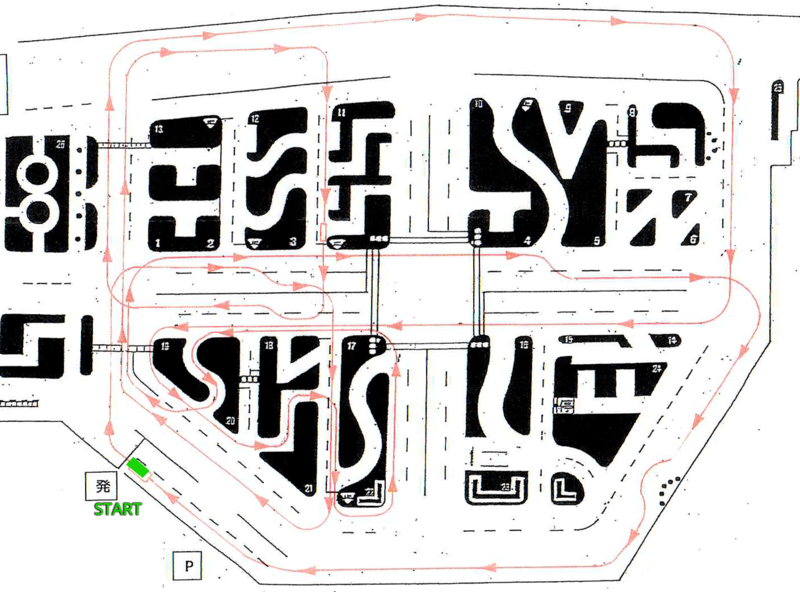 This test consists of you driving one of their vehicles (the same kind of car as the taxi’s you see) around a driving course which is part of the Unten Menyo Center. This is really the key section of this blog post, and the secret to passing the test. Every day prior to taking the practical test, visualize yourself driving through your memorized course and every precaution that you must take. I’m serious. Sit in a chair, and pretend it is the drivers seat. Have someone watch you, and explain to them every action. When you lay in bed at night and closer your eyes, see the course. Imagine someone sitting in the back seat and an instructor silently critiquing you. If you are unable to invest in the actual driving school, you must school and judge yourself with repeated visualization of the course and steps to take along the way. Given this – how important is it to learn your weak spots in that initial lesson? I would say – critical. On the actual test day you will return with all of the identical, required paperwork. You and a group of others will be lead to a small room where you will take the written test. In my group, 10 out of 10 people passed the written. A good website with sample tests is located here. You’ll then be instructed to head over to the actual testing course located behind the Unten Menkyo center. Prior to the test, you’ll sit in a small classroom format and the instructor will inform you what will take place. If you are sitting here waiting for the instructor, do not waste time. Use these moments to visually study the course, because you may be the first to go! Following the instructor explanation, he/she will explain who will go first, second, third, etc. If you are “next” then you have the benefit of riding in the back of the car of the person who is actually testing. Another HUGE benefit to study the course. In my experience, the instructor says very little (unless you crash or test is ended) until you are done. He will offer some limited feedback privately to the test taker. Tell the Instructor – Yoroshiku Onegaishimasu! Following your test, the instructor will offer some criticisms. This doesn’t necessarily mean you failed! I was corrected on 3 different items. Even if you passed you will have to wait around for some time to find out the results. Congratulations. You passed! Or you failed. If you passed, you’ll pay up some more fee’s for a license. If you failed, you will reschedule for a future date. If you failed – while in the area, it might not hurt to take one or more driving school lessons. Let me know how your experience went by returning to the blog-post (short version of this page) and leaving a comment!